Starting with the Janina Ultra White Toothpaste* This is an everyday use toothpaste which I thought was great because you brush your teeth everyday but now while doing that you can also be whitening your teeth! This toothpaste is really minty, so much so that it wakes me up for my 3am work starts. If you're not a fan of a real minty taste (or the slight burn) this may not be for you, but it definitely leaves your mouth minty fresh! As this is an everyday use I did notice results using this quite quickly, while it didn't totally change my teeth to pearly whites within a week it definitely did whiten them a couple of shades than what they were prior to me using this. It's also quite a big bottle and you get a very long time out of it, I've been using it for over a month and I'm only half way through the tube which is great as you definitely get your moneys worth out of it. The tube of toothpaste will set you back £12.49 which you're probably thinking "what!? for a toothpaste!?" but remember while looking after your teeth daily you're also whitening them and it definitely does make a difference. 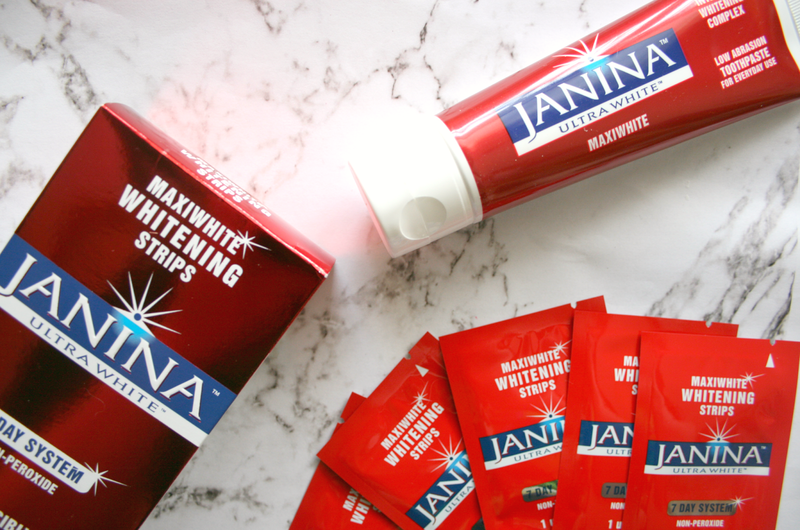 Teeth Whitening strips scare me, just because of the horror stories and reviews I have read from people using them, so when I received the Janina Ultra White 7 Day System Strips* I was slightly scared. However after about staring at the box for a week I finally got up the courage and used one. You get a strip for your top row of teeth and bottom and you simply just stick them on and go about your business for 30 minutes. While your thinking "but hold on Jordan surely you're destroying your teeth using so much hydrogen peroxide on them", false! What I loved about this brand is that it's hydrogen peroxide free and instead they use an ingredient which is enamel friendly so it won't destroy your teeth! The strips worked wonders and after using the first one I could notice a huge difference. I also think using both the strips and toothpaste along with each other really made a difference and gave me results a lot quicker than someone who may just be using one or the other. The 7 day system of strips will set you back £19.95, while slightly more expensive than the toothpaste I did feel like these gave you instant results so you'll see a difference after the first use. Janina also sell both products as a set and they're currently on offer for just £25.99 saving you 20%! If you are looking into products to remove stains and whiten your teeth I'd definitely recommend checking out this brand as I've really enjoyed using the products. While I have used up all the strips I still have half a tube of toothpaste left which I will continue to use to keep my teeth looking glimmering! You can find out more about the products and the other ones they have to offer on their website here. Have you ever tried Janina Ultra White products?